Four and a half decades ago there were not many chaat shops in Bangalore. Deepak Chaat Shop was the only one in the vicinity which catered to the needs of Chaat lovers who hung around Brigade Road and M.G. Road in the evenings. 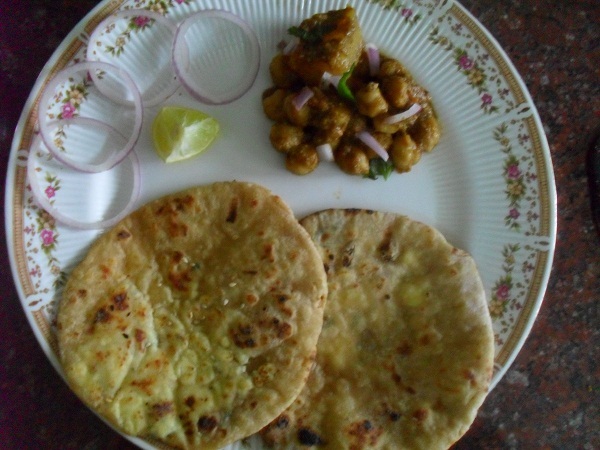 The sweet couple who ran the show cooked the most delicious Chaat dishes and served them to the customers with untiring enthusiasm.The heavenly taste of Alu Chole which they served with their special spongy and golden brown saucer sized bhaturas is still fresh in my memory. When I shared my nostalgia with D2, she eagerly enquired about the taste and analysed the ingredients that might have gone into such a delicious Alu Chole. I was immensely pleased when D2 gave me a thumbs up and said ''yummmy!" after tasting the first spoon of Alu Chole which we cooked together in my kitchen. The efforts made to recreate the nostalgic Alu Chole with the available ingredients in my kitchen did not go waste after all! 2. 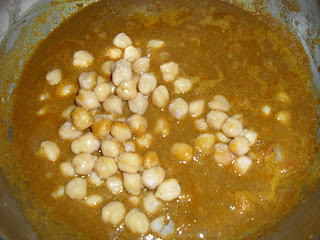 Pressure cook the pre soaked chick peas and potatoes until three whistles and allow to cool. 3. Grind the chopped onions with coriander seeds, pepper, cumin seeds, one green chilly, ginger, garlic, turmeric powder, chilly powder, cinnamon, cloves and cardamoms into a smooth paste adding little water. 4. 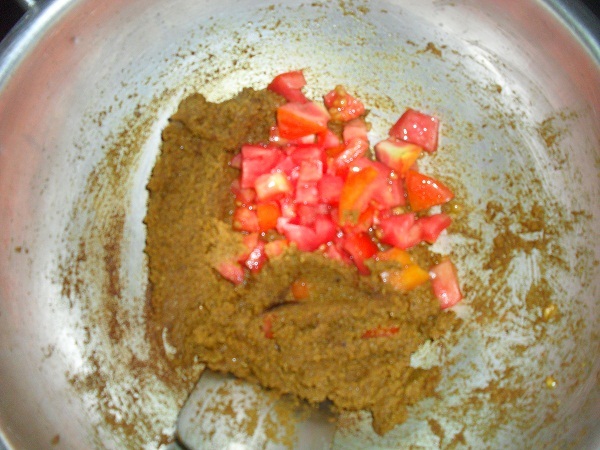 Heat oil and fry the paste till it does not stick to the pan and till you get a very pleasant aroma. 5. Add the chopped tomatoes and salt and cook till soft but not mushy. 6. Add the tamarind extract, jaggery and one slit green chilly. 7. 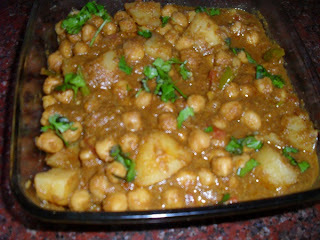 Next add the cooked Chana and cook for another five minutes. 8. 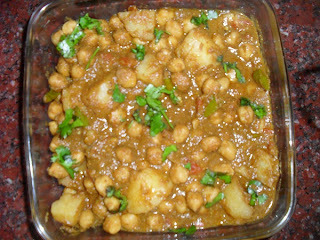 Peel and cut the cooked potatoes into big cubes and add it to the gravy. 9. Add more water if the gravy is too dry and continue to cook for another two or three minutes till all the ingredients blend together. 10. Switch off flame and garnish the Alu Chole with chopped coriander leaves. Serve the sweet, spicy and tangy Alu Chole with freshly chopped onions and a wedge of lime. We relished Alu Chole with Paneer paratas.